RECAP HERE OF GOP CONVENTION Day 1 Speeches on Monday, July 18th. #RNCinCLE. See links provided. 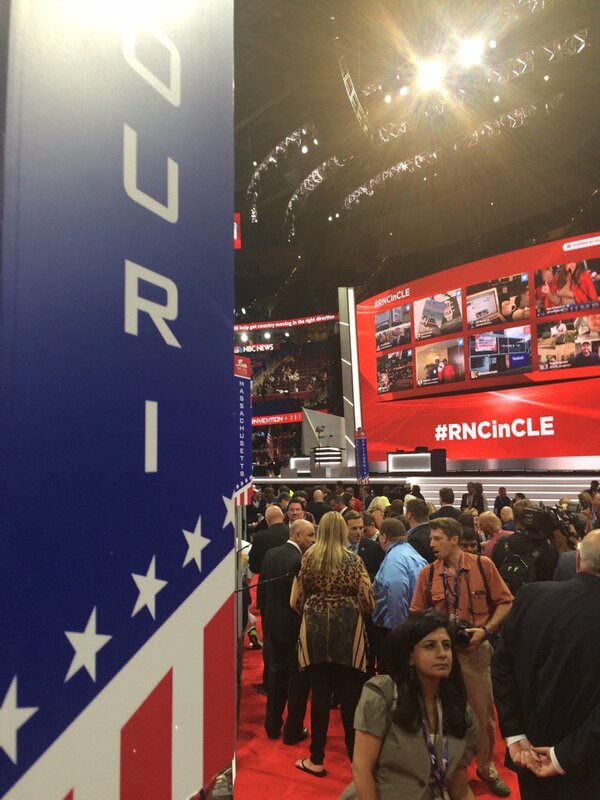 Thank you for joining us during Day 1 of the 2016 @GOPConvention! Monday, July 18th Day 1 of #RNCinCLE. Morning delegate breakfast, live Tweets as they happen and more. 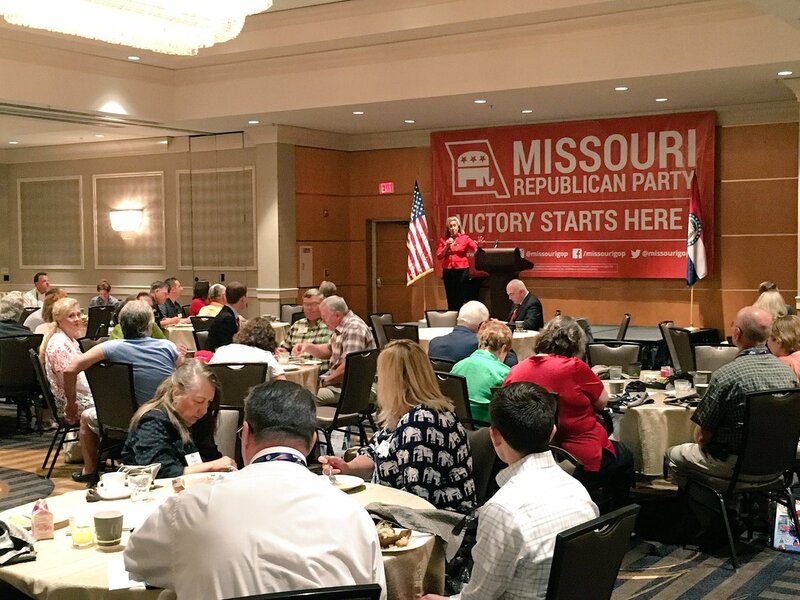 Our thanks to the Missouri Delegation host hotel for a delightful breakfast today. Immediately following that we had our usual business meeting with guidelines for the day's events and transportation to Quicken Arena. Congresswoman Ann Wagner, photo courtesy of MRP. 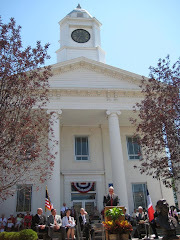 Congressman Sam Graves, photo courtesy of MRP. Delegates, Alternates and Guests received their credentials for the day at breakfast and received clear plastic convention tote bags, Secret Service approved, of course. Then, we were bussed to The Q in downtown Cleveland for Session 1 at 1 p.m. and Session 2 at 8 p.m. Outside at the area between the Cleveland Indians Stadium and Quicken Arena, we were treated to food galore and other amenities for convention goers. Live music on stage provided some rockin' entertainment between sessions. Cleveland once again did a wonderful job of organizing the event and providing for our every need. Approved tote bags for Delegates, Alternates and Guests at RNC 2016. It didn't take long for worldwide media to find and interview Missouri's own George Engelbach, a.k.a Abe Lincoln. 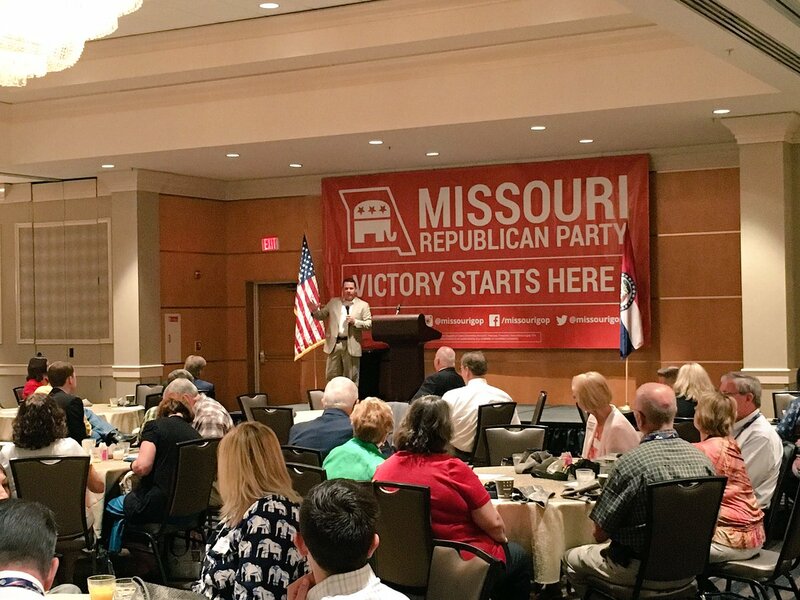 Find play-by-play accounts of Session 1 and 2 happenings on these interesting Twitter accounts: @MoGOP19, and @Rep_TRichardson @EricBurlison @GOPconvention. #RNCinCLE -- Missouri Delegation arrives safely and happily in Cleveland and settles in for an anticipated phenomenal week ahead. MRP Executive Director Jonathon Prouty welcomes the Missouri Delegation at our host hotel on Sunday afternoon. 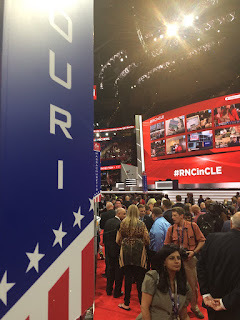 Good morning from Cleveland, Ohio, where our Missouri Delegation is about to begin Day #1 of the RNC 2016 Convention with two sessions, one at 1 p.m. and the evening session beginning at 8 p.m. eastern time. Yesterday, we settled into our hotel rooms and then met at 3 p.m. for an ice cream social, credentialing, and a short meeting. MRP Executive Director Jonathon Prouty presented security information, general rules and guidelines for the week, and welcomed the afternoon arrivals. Several delegates and alternates would arrive later in the evening. MRP Chairman John Hancock gave welcoming remarks and thanked the hotel for the smooth check-in process and thanked the stellar MRP staff and volunteers who have been in Cleveland for days preparing for the Missouri Delegation's arrival. Hancock, who has also been in advance meetings in Cleveland, said to expect an exciting, meaningful and phenomenal event this week. Missouri's National Committeewoman Susie Eckelcamp and Committeeman Gordon Kinney as well as the MO Delegation Caucus and Rules committee members came days in advance as well. For all those at home concerned about security at the convention, rest assured we are well protected. Thank you to those in all branches of law enforcement who are working so hard this week in Cleveland to make everyone here safe--Secret Service, Homeland Security, police, fire fighters, military personnel, emergency medical teams. It is quite a sight to witness. The Convention support staff including bus drivers and guides were kind, always helpful and professional. Good job Cleveland Host Committee! The Welcome Party was titled "Eat, Drink, and Party Like a Rockstar". Servers with trays of appetizers and beverages met us as we arrived, and then we began exploring the complex along the waterfront and promenade. A large variety of food trucks featuring local vendors provided excellent offerings from fresh perch/veggie sliders to a variety of barbecue, pizza, sandwiches and more. We toured the Great Lakes Science Center and the Rock and Roll Hall of Fame. The Rock and Roll Hall of Fame featured live entertainment throughout as well as on the lawn outside. There we could see everything from Michael Jackson's sequined glove to David Bowie's stage outfits and Lady Gaga's meat dress. No kidding. It was as though we were walking through a soundtrack of our lives, listening to music from every era of Rock and Roll's evolution. 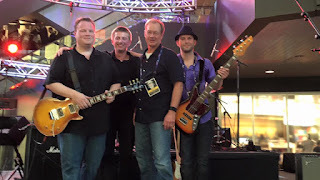 MISSOURI SIDETONE: LAST NIGHT AT 7:30 PM, Missouri's own Kenny Hulshof took the stage at the Rock and Roll Hall of Fame with his group and entertained. How fun was that! at the Welcome Event on stage at the Rock and Roll Hall of Fame. And now, off we go for Day #1 of the Convention. Gifts waiting for us at the hotel and more. Trump teeshirt and Trump water were also included. Yes, we got Trump water! Inside Rock and Roll Hall of Fame featuring live entertainment throughout the evening.